"Sampath Speaking" - the thoughts of an Insurer from Thiruvallikkeni: Google green doodle on Dr Anandi gopal Joshi ~ a tragic story !!! Google green doodle on Dr Anandi gopal Joshi ~ a tragic story !!! As is usual, today too started with Google search page ~ lured by the green doodle. It is an Indian woman, Anandi Gopal Joshi who is honoured with a Google doodle on what would have been her 153rd birthday. Today’s Doodle is created by Bangalore-based artist Kashmira Sarode who imagines Joshi celebrating her degree. She was India’s first Doctor but, tragically Joshi’s young life was tragically cut short when she died of tuberculosis before her 22nd birthday. Her legacy and the path she paved for generations of women continues today. Interestingly, even a crater on Venus is named after her! Anandibai Gopalrao Joshi lived between 1865 and 1887 only. She was born this day. She was the first woman of Indian origin to study and graduate with a two-year diploma in medicine in the United States. She is also believed to be the first Indian woman to set foot on American soil. She was born in Yamuna, in Kalyan of the Thane district. Kalyan but had lost their economic wealth. As that was the practice at that time, Yamuna was married at the age of nine to Gopalrao Joshi, a widower almost twenty years her senior, due to pressure from her family. Gopalrao Joshi worked as a postal clerk in Kalyan. Later, he was transferred to Alibag, and then, finally, to Calcutta. At the age of fourteen, Anandibai gave birth to a boy, but the child lived only for ten days because the medical care necessary for his survival was unavailable. This situation proved to be a turning point in Anandibai's life, and inspired her to become a physician. Her husband encouraged Anandibai to study medicine. In 1880 he sent a letter to Royal Wilder, a well-known American missionary, stating Anandibai's interest in studying medicine in the United States, and inquiring about a suitable post in the US for himself. While the Joshi couple was in Calcutta, Anandibai's health was declining. She suffered from weakness, constant headaches, occasional fever, and sometimes breathlessness. Theodicia sent her medicines from America, without results. In 1883, Gopalrao was transferred to Serampore, and he decided to send Anandibai by herself to America for her medical studies despite her poor health. Though apprehensive, Gopalrao convinced her to set an example for other women by pursuing higher education. 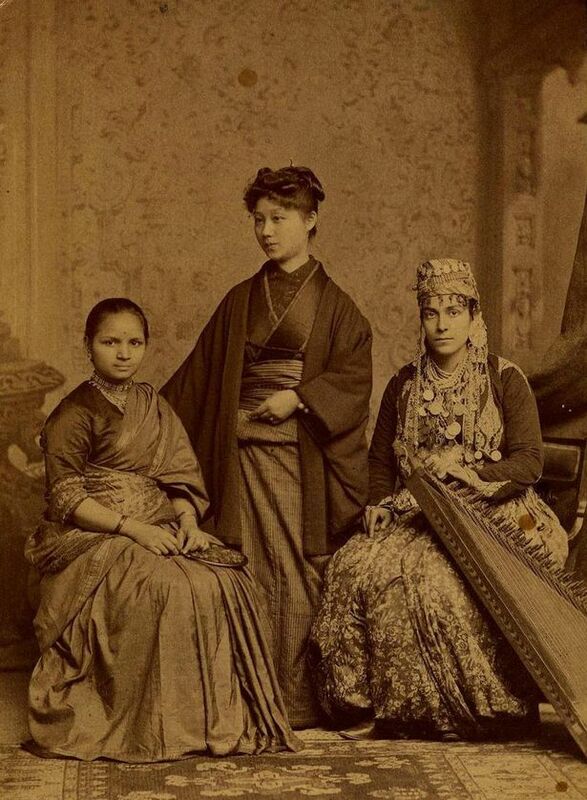 Anandibai Joshee graduated from Women's Medical College of Pennsylvania (WMC) in 1886. She is seen above with Kei Okami (center) and Tabat Islambooly (right) – source Wikipedia. All three completed their medical studies and each of them was the first woman from their respective countries to obtain a degree in Western medicine. Anandibai travelled to New York from Calcutta by ship, chaperoned by two female English acquaintances of the Thorborns. Anandibai wrote to the Women's Medical College of Pennsylvania, asking to be admitted to their medical program, which was the second women's medical program in the world. Rachel Bodley, the dean of the college, enrolled her. Anandibai began her medical education at age 19. In America, her declining health worsened because of the cold weather and unfamiliar diet. She contracted tuberculosis. Nevertheless, she graduated with an MD on 11 March 1886; the topic of her thesis was "Obstetrics among the Aryan Hindus". On her graduation, Queen Victoria sent her a congratulatory message. In late 1886, Anandibai returned to India, receiving a grand welcome. The princely state of Kolhapur appointed her as the physician-in-charge of the female ward of the local Albert Edward Hospital. Anandibai died because of tuberculosis early the next year on 26 February 1887 before turning 22. The Institute for Research and Documentation in Social Sciences (IRDS), a non-governmental organization from Lucknow, has been awarding the Anandibai Joshi Award for Medicine in reverence for her early contributions to the cause of advancing medical science in India. In addition, the Government of Maharashtra has established a fellowship in her name for young women working on women’s health ~ and today’s Google doodle honours her. Gleaning the web, Elizabeth Blackwell (1821 – 1910), a British physician, was the first woman to receive a medical degree in the United States and the first woman on the Medical Register of the General Medical Council. She was the first woman to graduate from a medical school, a pioneer in promoting the education of women in medicine in the United States, and a social and moral reformer in both the United States and the United Kingdom. Her sister Emily was the third woman to get a medical degree in the US. Dame Mary Ann Dacomb Scharlieb, DBE (1845 – 1930) was a pioneer British female physician and gynaecologist. She was to marry William who at that time edited the Madras Jurist, a journal for practising lawyers. Mary Anne helped him in this task. She joined midwifery training. In addition, she offered voluntary service as a ‘nurse’ at the lying-in hospital in Madras. This was when Edward Balfour pioneeringly decided to open the gates of Madras Medical College for women. Mary Anne was one of the first four women to take advantage of this opportunity. She was admitted to pursue a Licentiate in Medicine & Surgery (LM&S), a three-year programme then offered at Madras Medical College. Years later she was to return to England where she met Dr. Elizabeth Anderson, the only qualified medical woman until 1877, who had just then started the London School of Medicine for Women (LSMW). She thought that Mary Anne was physically unfit to pursue a stressful degree programme. Mary Anne persevered and was finally accepted as a student at LSMW in 1879. In Nov 1882, at the age of 37, she was awarded her MB degree by the University of London, with Honours in all subjects and a gold medal in obstetric medicine. Mary Anne was the first woman to win this distinction in the annals of the University of London. Winning the gold medal entitled her to a scholarship to further enhance her skills in surgical obstetrics. She availed herself of the opportunity and went to Vienna (Austria) to train in surgical obstetrics. Mary Anne and William returned to Madras in 1883. With support from the then Government, largely influenced by Edward Balfour, who was the Surgeon-General at the time, the Queen Victoria Hospital for Caste and Gosha Women was founded in Moore’s Garden, Nungambakkam. (Yes, it is the present day Kasturba Hospital (Gosha hospital) at Triplicane) and this pioneering woman’s Triplicane connection as the hospital moved to its present place in 1890.